Public Health Service of Italy accepts work of Ruggiero et al. 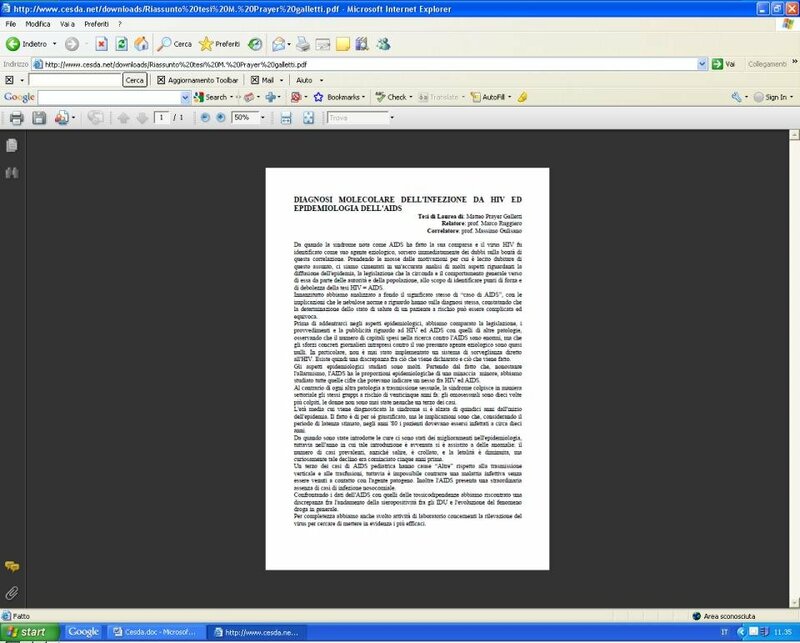 On 12 July 2009, this blog published a press release reporting the acceptance (on 3 June) by the journal Medical Hypotheses of an article by Professor Ruggiero and co-workers at the University of Florence pointing out that official policies of the Italian Ministry of Health implied a lack of necessary connection between HIV and AIDS [“Official Italian data: no causal connection between HIV and AIDS”, 12 July 2009]. 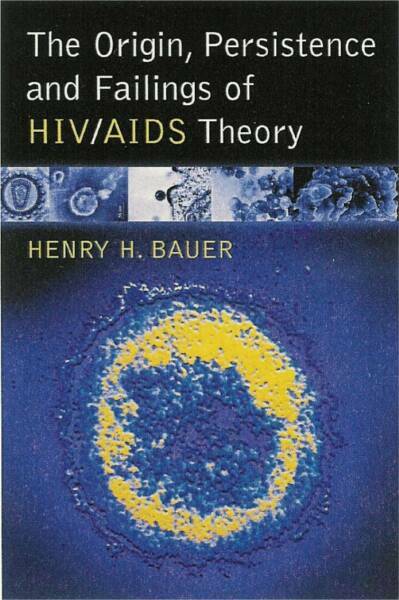 Consternation ensued among HIV/AIDS vigilantes that so well established, indeed distinguished a research group had produced such a publication. AIDStruthers and other vigilantes organized a letter-writing campaign urging Elsevier — the current publisher of Medical Hypotheses — to withdraw this article which had already been posted on the journal’s website as “in press”. At the same time the letter-writing HIV/AIDS campaigners urged the withdrawal of an article by Duesberg et al. that had been accepted by Medical Hypotheses on 11 June, which pointed out that official South African statistics recorded AIDS deaths at about 12,000 annually while an article in JAIDS had alleged 25 times that number; Duesberg et al. noted too that JAIDS had refused to publish their rebuttal of the flawed article. The HIV/AIDS vigilantes also sent letters to the National Library of Medicine urging that MEDLINE no longer abstract Medical Hypotheses. Elsevier’s stated reasons why articles in press might nevertheless be withdrawn include “potentially libelous” content and “potential threat to global public health”. 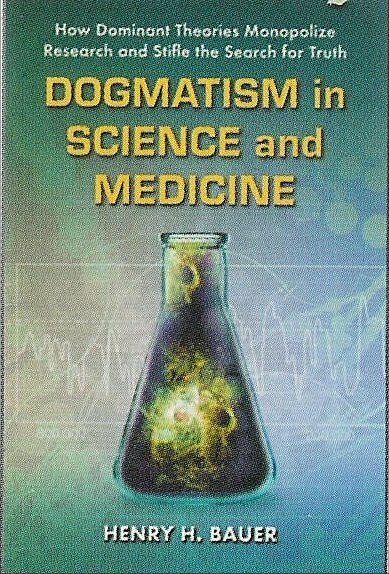 I invite anyone and everyone to judge for themselves whether either of those potentialities exists in those articles, and moreover to ponder what is common to those articles other than questioning HIV/AIDS theory on the basis of substantive evidence; and what about the articles warrants withdrawal after acceptance, by comparison to the 200+ articles still posted at the Medical Hypotheses website as “in press”. Professor Ruggiero has now been able to point out that the Italian Ministry of Health has actually found helpful the work that he and his students have published, since they have revised some of their policies accordingly. Moreover, the Italian Public Health Service has officially recognized the work by making dissertations available from its website. “The theses of Drs. Simone Scarpelli, Matteo Prayer Galletti, and Elda Muca, previously discussed and approved by the University of Firenze, Italy, received official recognition by the Italian Public Health Service and they are now available at the Center for Study and Research on Drug Abuse and AIDS, a Department of the Public Health Service. 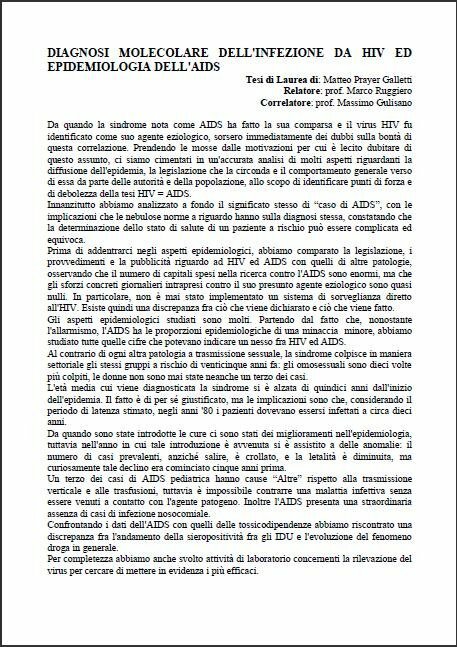 It is worth noting that the thesis of Dr. Matteo P. Galletti (now available at request at http://www.cesda.net, in Italian with an English abstract) was the starting point of the article in Medical Hypotheses (M. Ruggiero, M. P. Galletti, S. Pacini, T. Punzi, G. Morucci, M. Gulisano, “Aids denialism at the ministry of health” (doi:10.1016/j.mehy.2009.06.002), as stated in the article. Screen shots of the relevant Web pages are attached below: click them (or double-click, depends on browser) for a full-size image. There is at the end a downloadable pdf of this blog post. Here is a PDF of this blog post. Consternation ensued among HIV/AIDS vigilantes that so well established, indeed distinguished a research group had produced such a publication. AIDStruthers and other vigilantes organized a letter-writing campaign urging Elsevier — the current publisher of Medical Hypotheses — to withdraw this article which had already been posted on the journal’s website as “in press”. At the same time the letter-writing HIV/AIDS campaigners urged the withdrawal of an article that had been accepted by Medical Hypotheses on 11 June, by Duesberg et al., which pointed out that official South African statistics recorded AIDS deaths at about 12,000 annually while an article in JAIDS had alleged 25 times that number; Duesberg et al. noted too that JAIDS had refused to publish their rebuttal of the flawed article. Elsevier’s stated reasons why articles in press might nevertheless be withdrawn include “potentially libelous” content and “potential threat to global public health”. Professor Ruggiero has now been able to point out that the Italian Ministry of Health has actually found helpful the work that he and his students have published, since they have revised some of their policies accordingly. 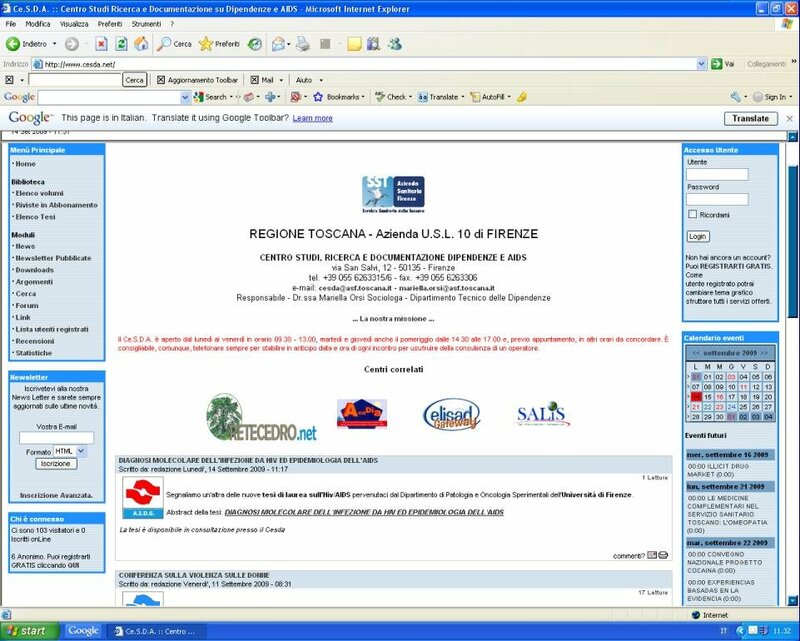 Moreover, the Italian Public Health Service has officially recognized the work by making dissertations available from its website. 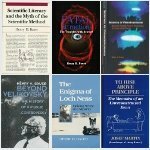 “The theses of Drs. Simone Scarpelli, Matteo Prayer Galletti, and Elda Muca, previously discussed and approved by the University of Firenze, Italy, received official recognition by the Italian Public Health Service and they are now available at the Center for Study and Research on Drug Abuse and AIDS (www.cesda.net), a Department of the Public Health Service. Screen shots of the relevant Web pages are attached below. The difficulty of sizing these for the blog while retaining clarity made it desirable to extract screen shots of the relevant items. Reproductions of the full web pages follow, and finally there is a downloadable pdf of this blog post in which the full web pages are in legible form. “A nutritional formula . . . may help slow CD4 cell decline and reduce immune activation” [Liz Highleyman, reporting on “Reduced CD4+ T cell decline and immune activation by NR100157, a specific multi-targeted nutritional intervention, in HIV-1 positive adults not on antiretroviral therapy (BITE)” by J. Lange et al., presented at the 49th Interscience Conference on Antimicrobial Agents and Chemotherapy, San Francisco, 12-15 September 2009; Abstract H-1230b]. “Pedro Cahn and colleagues with the international BITE study aimed to determine whether a combination nutritional formula could reduce CD4 cells loss in people on ART. 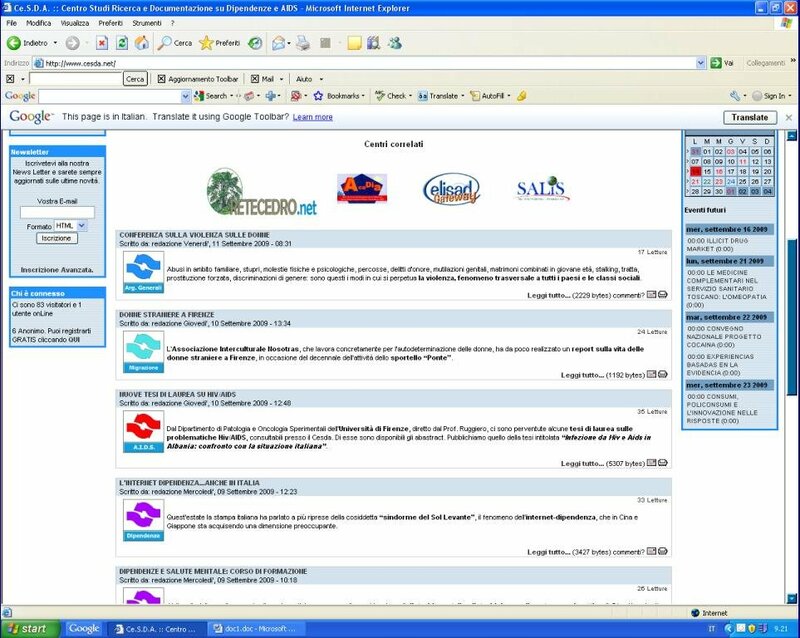 The randomized controlled trial was designed to include 800 HIV positive participants in Argentina, Australia, Brazil, Italy, the Netherlands, Thailand, the U.K., and the U.S. Half were randomly assigned to take the nutritional formula, known as NR100157, for 1 year, while the other half received a control product containing the same amount of calories and protein, but without the active ingredients. NR100157 contains several components that individually have demonstrated beneficial effects on immune function in previous studies: Prebiotic oligosaccharides: chains of simple sugars that help maintain healthy flora, or balance of bacteria in the gut; N-acetyl cysteine: a modified amino acid that helps maintain the body’s supply of glutathione, a key antioxidant; Bovine colostrum: nutrient- and antibody-rich fluid produced prior to milk; Omega-3 long-chain polyunsaturated fatty acids: molecules shown to improve the integrity of the gut, which prevents bacteria from leaking out and triggering systemic immune activation; Micronutrients including vitamins and minerals. The study was stopped early after a planned interim analysis showed significant immunological benefit in the NR100157 arm and no notable safety concerns. . . . Participants in the NR100157 arm lost significantly fewer CD4 cells per year than those in the control arm (-28 vs -68 cells/mm3, respectively; expected loss for untreated people with HIV 50-70 cells/mm3 annually). There were no significant differences between the 2 arms with regard to CD4 percentage, CD8 cell count, or CD4/CD8 ratio. Plasma viral load remained stable, and similar, in both groups” [emphases added]. 1. Maintaining healthy gut flora benefits immune function: that’s what Tony Lance discussed in his intestinal dysbiosis hypothesis, including the aspect of gut leakage, systemic immune activation, and potentially testing “HIV-positive” [“What really caused AIDS: Slicing through the Gordian Knot”, 20 February 2008]. 2. The “viral load” was stable while CD4 counts varied: in other words, once again, changes in CD4 counts do not correlate with “viral load” [Rodriguez et al., JAMA, 296 (2006) 1498-1506]. “The data and safety monitoring board (DSMB) recommended stopping BITE early because of a significant difference in CD4 decline between groups and lack of safety concerns. An intention-to-treat analysis at 52 weeks showed a significantly slower annual average CD4-cell drop in the NR100157 group, 28 versus 68 cells/mm(3) with placebo (P = 0.030). . . . In a question-and-answer session after Argentina’s Pedro Cahn presented these findings, Harvard’s Daniel Kuritzkes claimed to be ‘stunned’ that the DSMB would stop the trial of an apparently safe agent when the statistical difference between treatment arms reached only 0.03. He also questioned the investigators’ decision to take the DSMB’s advice. Kuritzkes felt stopping a trial at such a low level of significance leaves open the possibility of bias toward a positive finding” [emphases added]. 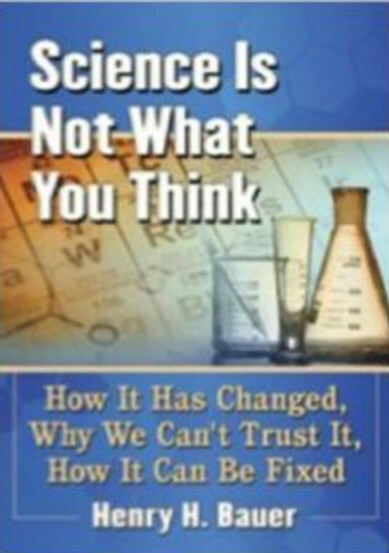 I suppose Kuritzkes would have been even more astonished that researchers stopped trials of circumcision early on the basis of the usual “95% confidence interval” — i.e., wrong once in 20 times; or that they were ecstatic over the first apparent success of a vaccine trial after many failures, even though one would have expected such an APPARENT success sooner or later at that usual “p<0.05”, “wrong once every 20 times”, criterion. I agree that a single clinical trial is inconclusive, no matter what level of statistical significance may be reached. I agree that p=0.03 is not in itself a particularly convincing result; still less so, of course, are all the mainstream trials that accept the weaker p<0.05; not to speak of the statistical ignorance that allows researchers at the Centers for Disease Control and Prevention and elsewhere to confuse correlation with causation and to say such things as “nonsignificantly lower” [“Abuses of statistics in HIV/AIDS research”, 14 September 2009]. My point here is just that alternative treatments are criticized while even worse examples of mainstream contentions are given free passes or even praised. “An experimental HIV vaccine has for the first time cut the risk of infection, researchers say. . . . The vaccine was a combination of two older vaccines that on their own had not cut infection rates. . . . The results found that the chances of catching HIV were 31.2% less for those who had taken the vaccine — with 74 people who did not get the vaccine infected and 51 of the vaccinated group infected. . . . ‘This result is tantalisingly encouraging. The numbers are small and the difference may have been due to chance, but this finding is the first positive news in the Aids vaccine field for a decade,’ said Dr Richard Horton, editor of the Lancet medical journal” [emphases added; “HIV vaccine ‘reduces infection’”]. “’Before this study, it was thought vaccine for HIV is not possible,’ Col. Jerome Kim, who is the HIV vaccines product manager for the U.S. Army, told CNN. Kim emphasized that the level of efficacy was modest, but given the failures of previous HIV vaccine trials, ‘yesterday we would have thought an HIV vaccine wasn’t possible.’ He called the results from the trial an important first step that will help researchers work toward a more effective vaccine. . . . ‘This shows a statistically significant effect,’ Kim said. . . . Researchers will announce details of their initial findings in October at the AIDS Vaccine Conference in Paris, France. The study was funded by the National Institutes of Allergy and Infectious Diseases and the U.S. Army Medical Research and Materiel Command. According to Kim, the U.S. military was involved in the study because U.S. service members are at risk and ‘there’s a national security threat from HIV’” [emphases added; “Combo vaccine reduces risk of HIV infection, researchers say”]. What makes “HIV” a “national security threat”? Why did the news media broadcast something that has yet to be announced? Why the difference between the BBC’s report that the results may be due to chance and CNN’s report that they are statistically significant? Who calculated “31.2%”? If the actual numbers had been 50 and 74 instead of 51 and 74, it would have been 32.4; if 52 and 74, 29.7%. Or — as anyone who ever learned about “significant figures” in math should know, or as common sense might also indicate, you can’t start with numbers that have only two digits in them, like 54 and 74, and calculate to an accuracy of 3 digits. The only proper description of the difference would be “about 30%”. Might we expect some at least speculative discussion about how two vaccines that had no effect could have an effect when combined? Unwarranted public kudos for the researchers and a further entrenchment of the notion that “HIV” is a threat to everyone. 125 people among 16,000 became “HIV-positive” over a period of 3 (CNN) or 7 (BBC) years: about 8 per thousand, so 1.1 (BBC) or 2.7 (CNN) per thousand per year. “HIV-positive” rates of a few per thousand are common in many “low-risk” groups. It is known that DOZENS of conditions — for example vaccinations, various infectious diseases (other than “HIV”! ), pregnancy — can bring on an “HIV-positive” result. The difference between 51 and 74 could very easily result from differences between vaccinated and placebo groups in rates of pregnancy, flu, anti-tetanus shots, abuse of steroids, or any number of other circumstances. The belief that babies can supposedly contract “HIV” through breastfeeding by “HIV-positive” mothers, as HIV/AIDS dogma insists, generates the well established, long recognized conundrum that babies of “HIV-positive” mothers become “HIV-positive” less often when they are breastfed than when fed on formula [sources cited at “More HIV, less infection: the breastfeeding conundrum”, 21 November 2007; “HIV and breastfeeding again”, 13 February 2008]. “Breast-feeding presents another challenge: While it can lead to infection of the infant of an HIV-positive mother, the mother’s milk also protects the child against many common infections of infancy, Palumbo says. [Paul E. Palumbo, M.D., is professor of medicine and pediatrics at Dartmouth Medical School and executive director of the Dartmouth-affiliated DarDar Pediatric Program in Tanzania.] Also, formula feeding to prevent transmission of HIV — a common practice in the developed world — leaves infants prone to suffer from upper-respiratory infections, diarrhea, and other maladies. According to estimates of the World Health Organization (WHO) and the United Nations Children’s Fund (UNICEF), more than nine million children younger than 5 are expected to die each year — 17 percent from pneumonia, 17 percent from diarrhea, and 7 percent from malaria, as opposed to 1.5 percent from HIV/AIDS. At least 10 percent . . . already are or may be suffering from tuberculosis” [Weighing costs, benefits of HIV treatments — public release from Dartmouth College, 15 September 2009]. The hysteria over HIV/AIDS has meant that for nigh on two decades the world has been duped into considering the need for antiretroviral drugs to be the most urgent health issue in Africa, when even by official estimates HIV/AIDS takes only 1.5% of the African babies who die before the age of 5. On the other hand, it’s been shown that the simple and inexpensive act of providing mosquito nets can reduce drastically the incidence of malaria, which kills 5 times as many babies as HIV/AIDS is supposed to. Better sanitation, cleaner drinking water, and vitamin supplements to combat malnutrition could save an even larger number of babies than would the providing of mosquito nets. But the world has been oblivious to these African needs, which have been evident for half a century or more, while working itself into a frenzy over the purported need to get more and cheaper antiretroviral drugs. Neville Hodgkinson — among others — described in detail long ago how Africans themselves have learned to label every illness and every death “AIDS”, and every child being cared for temporarily by grandparents an “AIDS orphan”, because that brings all sorts of assistance while malaria, tuberculosis, malnutrition, etc., do not [Hodgkinson, AIDS: The Failure of Contemporary Science, 1996]. “We have a simple approach that is cost-effective, and reduces transmission [of HIV] by 50 percent. The Achilles heel of that approach is that in the mother and in any infant who does become infected, the virus learns to become drug-resistant” [emphasis added, because HIV/AIDS propagandists more typically claim that transmission from mother to child can be reduced to a negligible amount, and they typically fail to mention that evidently well-established phenomenon of subsequent drug resistance]. “Palumbo is co-leading a clinical study of anti-HIV medicines in Africa and India for the International Maternal Pediatric Adolescent AIDS Clinical Trials Group (IMPAACT). [I wonder whether medical schools teach special courses on how to construct project titles that lend themselves to PR-valuable acronyms like IMPAACT, SMART, etc.? Or perhaps they get help from the Pentagon, which names its wars and missions so enticingly.] The randomized trial found that a cohort of 82 HIV-infected children ages 6 to 35 months responded better to treatment with the protease-inhibiting drug lopinavir (LPV/r) than did a cohort of 82 children in the same age group who received the anti-retroviral drug nevirapine (NVP). The infants all had previously received a single dose of NVP in liquid form at birth, and their mothers each had taken NVP in the form of a single pill during labor in an attempt to prevent HIV transmission” — an attempt that had evidently failed in 50% of cases. There are also dangerous interactions with a host of other medications [Tables 15b, 16b]. Lopinavir (LPV/r) has the usual effect of stomach upsets and hyperlipidemia found with all protease inhibitors, as well as Stevens-Johnson syndrome (toxic epidermal necrosis) [Table 13] and hyperglycemia and fat maldistribution [Appendix Table 4], plus interaction with antifungals and some other drugs including some antibiotics[Table 15a].